Japanese “Salaryman” culture baffles me a bit. Apparently officemen work hard all day and repress their hopes and dreams, and then go out to a bar and get completely wasted! Not a bad life, I guess. And this where Izakaya comes in. It’s basically a drinking house where you can get food to accompany the copious amounts of alcohol. Everything is meant to be in tapas portions, because the booze is KING! Here in Australia, the portions are a little bit more meal sized to provide sustenance, and allow friends to enjoy a nice dinner together as well! Sea Urchin and Salmon Roe on Rice, part of the Hokkaido Gozen Bento. Bento boxes represent a fantastic variety of the restaurant has to offer, and here at Yebisu, it delivers more than I expected. The Hokkaido Gozen Bento had creamy sea urchin and salmon roe on sushi rice, maki rolls, salmon sashimi salad, sweet soy beef, agedashi tofu, mashed potato croquettes, crumbed crispy prawns, AND sweet yoghurt with coconut jelly. And miso soup. So many things that just wouldn’t fit in one picture. At a $29.95 price tag, this bento would actually feed 2 or 3 people easy, making this the best value for money bento I’ve seen in Sydney yet!! The beauty of Izakaya dining is also in the variety, and besides the amazingly huge bento, there are also smaller items that you can order. Cooked to a perfect medium rare, the Seared Wagyu Steak comes in a sizzling hotplate, with a creamy mash on the side and crispy bean sprouts on the bottom. The meat was tender, and while it wasn’t quite fatty enough for my taste, it tasted robustly of, well, beef. I think I’ve professed before my absolute love for fish on rice, and the Negitoro Donburi fits the bill exactly. 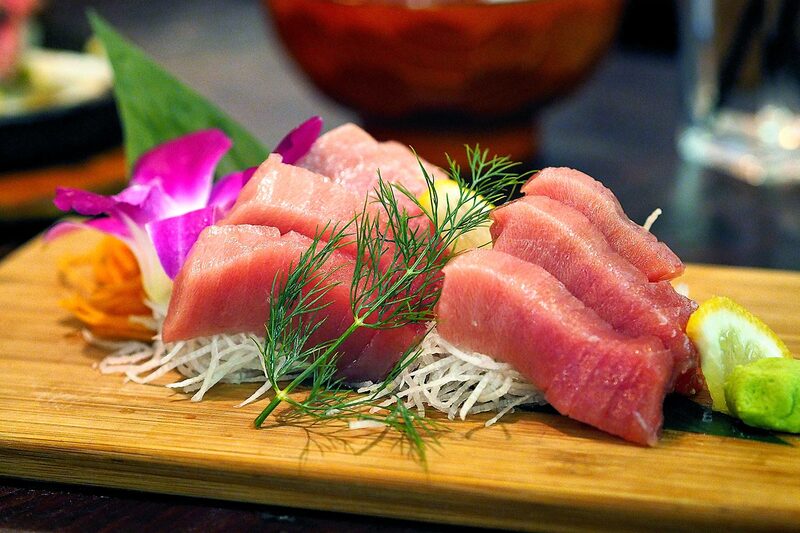 Minced fatty tuna (toro) is mixed with spring onions (negi) to create a comforting bowl of goodness. And I just had to count my lucky stars, because they happened to have super fresh tuna that day, from the 2nd birthday celebrations that they were having the night before! WIN WIN. Of course, if you have fish that fresh, you’re going to show off in your sashimi serving too, and this plate of Otoro Sashimi was shamelessly monopolised by me (sorry Sam!). Melt in your mouth tender, with the distinct meatiness that comes specifically from tuna, this had the effect of feeling oh-so-luxurious, as well as so healthy at the same time! Though, if fish was really as good for your brain as they say it is, I should be a lot smarter than I am now. Of course, we can’t finish without dessert! These chewy little mochi cakes are made with rice flour, and served with a brown sugar syrup and toasted soy bean flour for a nutty finish. Best part of all, is that it’s also part of a monthly special! And we all know I’m a chick who just loves a good bargain. And loyalty cards. I love those too. If you flash your Washoku Lovers club, you get to order the dessert of the month for just $3. The cheapskate in me is secretly rejoicing. Can’t make it out this month? No worries, because the $3 dessert next month are their ice cream profiteroles, which combine fluffy choux pastry, creamy ice cream, and azuki red bean paste for a veritable sugar high. Izakaya Yebisu, I hear, is holding different specials every month, which certainly adds a sense of excitement to dining there. The lunch menu is considerably shorter than the dinner menu, but if the Hokkaido Gozen Bento is of any indication, they’ve really just crammed all the variety into a value for money set. Insatiable Munchies dined as guests of Izakaya Yebisu and Washoku Lovers.